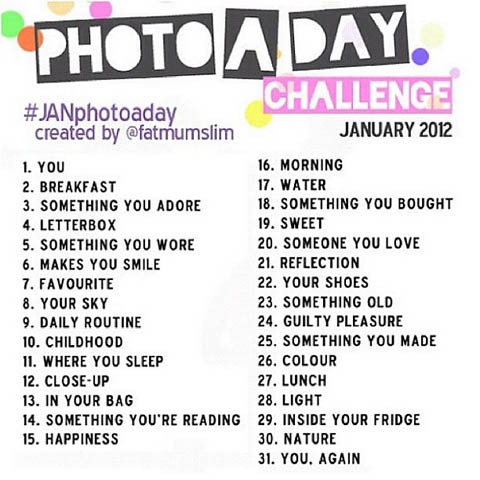 I loved the January Photo A Day challenge on Instagram - I know there are lots of these photo challenges out there, but this is the first one I've completed. It's turned me into more of an Instagram addict - I love these pretty little snapshots of life! 1. You | 2. Breakfast | 3. something You Adore | 4. Letterbox | 5. Something You Wore | 6. Makes You Smile | 7. Favourite | 8. Your Sky | 9. Daily Routine | 10. Childhood | 11. Where You Sleep | 12. Close-Up | 13. In Your Bag | 14. Something You're Reading | 15. Happiness | 16. Morning | 17. Water | 18. Something You Bought | 19. Sweet | 20. Someone You Love | 21. Reflection | 22. Your Shoes | 23. Something Old | 24. Guilty Pleasure | 25. Something You Made | 26. Colour | 27. Lunch | 28. Light | 29. Inside Your Fridge | 30. Nature | 31. You. Again. I started the Feb one and have already forgotten 2 days out of 6! FAIL! I wish I had kept up with this but I think I sort of lost way by around day 8! Oops. I love instagram and these challenges are a really fun way to experiment. I am attempting the Feb one after seeing so many others do the Jan one. I really love this challenge and you look adorable! I'm anxiously awaiting the instagram app for android, I've probably mentioned this before but the days are crawling by waiting for it! You're in a strange part of our town. Two left feet, I had no beat. Jenny was a friend of mine. Mysterious and spooky, altogether ooky.